In my last post I mentioned buying a cage for your bun. Here’s the issue with that. 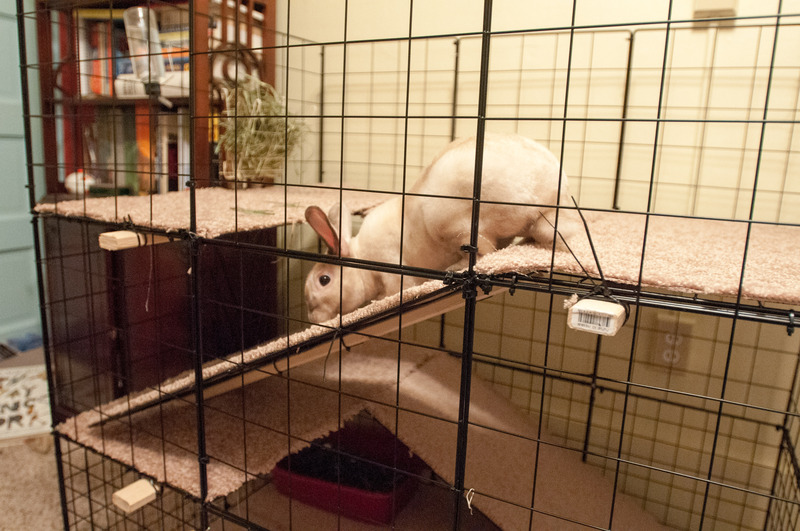 If you’re going to keep your bun inside of the cage for most of the day, those cages are not large enough AND they are expensive. So, here’s an alternative way to keep your bun happy and healthy. 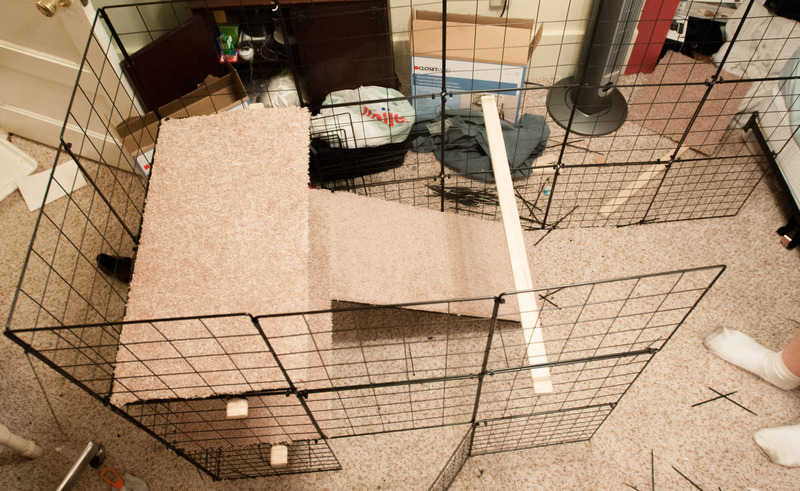 With the start of the blog, this seemed like the perfect time to build a bunny condo. So, I enlisted the help of the rabbits’ handy dandy dad, Michael and got to work. 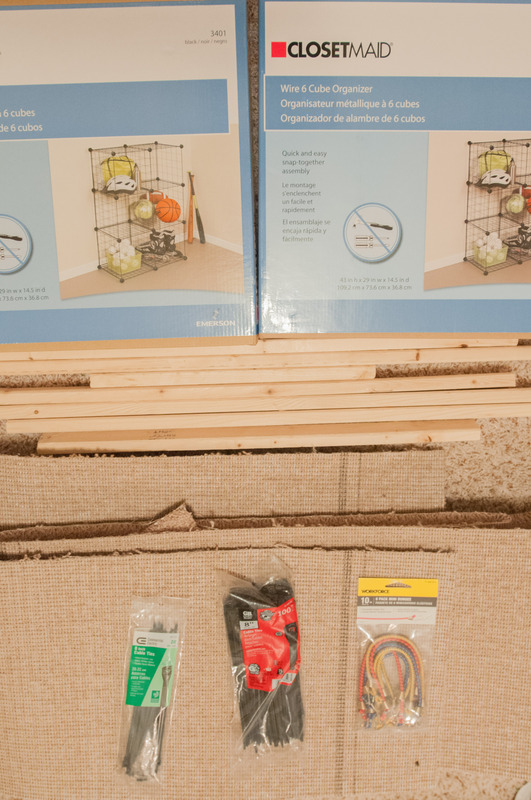 Next, to Home Depot to buy two packs of 100 zip ties (~$7.00), wood planks (~$3.00), carpet (~$15.00), bungee cords (~$4.00), a box cutter if you don’t already have one and a pair of scissors. We bought two longer wooden planks and cut them to size with the hand saw in Home Depot. These are the dimensions for the wooden planks we used: Three 31.5 in, two 27 in, and one 19 in plank. Supplies you’ll need. *note we had to buy 100 more zip ties. For the carpet, we went and found the cheapest kind that would be squishy enough to eliminate sore hocks. 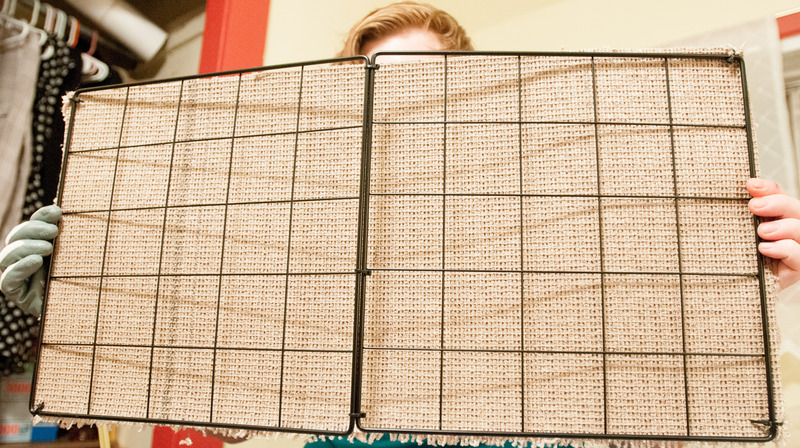 To start, you’re going to want to start zip tying the closetmaid grids together to make each wall. I recommend zip tying at every juncture. Over zip tying is better than under zip tying! You’re going to want to make two 2×3 walls, and two 3×3 walls. It is smarter to not attach the four walls together quite yet. At this point, make sure you’ve zip tied every where you can on each wall. Where four corners come together (like the picture above) make sure you use four zip ties. 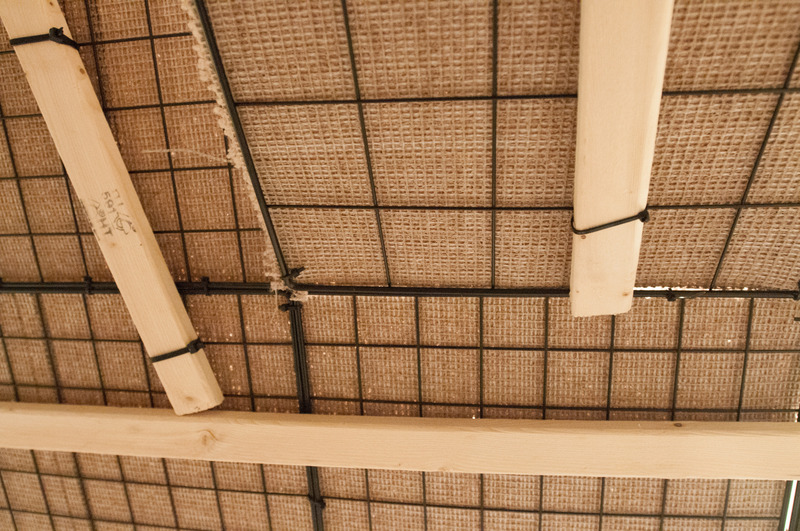 When two grids meet, make sure they have a zip tie at the top and a zip tie at the bottom. Your rabbit may attempt to help you. Make sure you have your camera handy! This next part gets a little tricky. I had michael work on making the levels and ramps, while I sorted out the carpet situation. 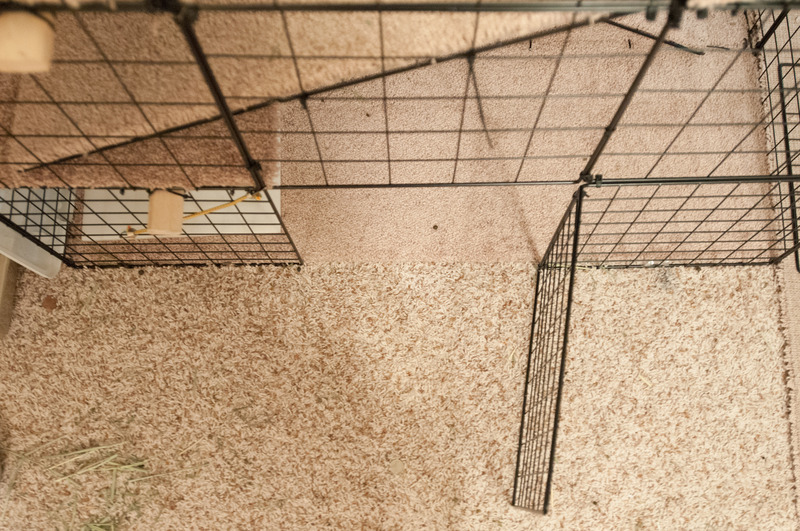 You’re going to want to install the carpet on the levels before you attempt to attach it to the walls of the cage. Michael needed to build two ramps. So he put two grids together and secured them, and then added one of the 27 in wood planks to the middle of the ramp. While he was working on ramps and levels, I was cutting the carpet to size and inserting zip ties in each corner so that the carpet could attach to the ramp or level. 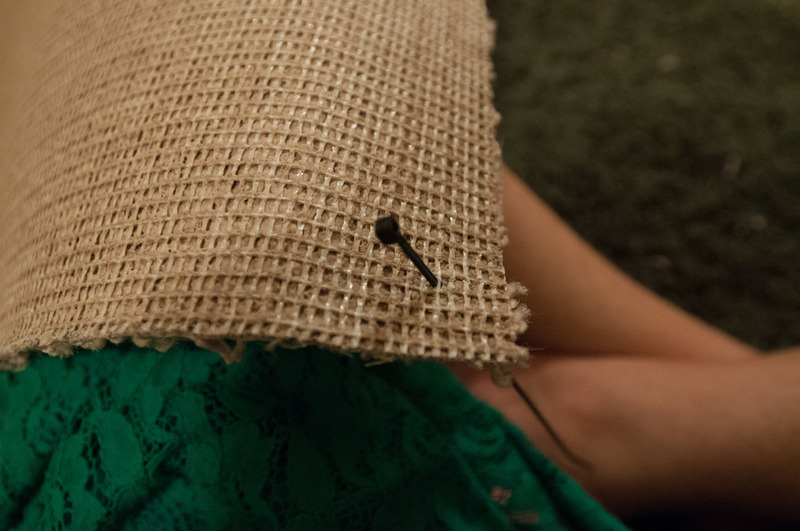 Poke small holes in the four corners of the carpet square you’re making. Add a zip tie so that it can be attached to a ramp or a level. Next, you can add the carpet to the ramp or level. As far as how many ramps and levels you’ll need, this is how we broke it down. Three 2-square levels, one 1-square level, and two 2-square ramps with wooden plank attached. For carpet pieces, it is the same as above, plus two 3-square pieces for the bottom of the cage. Attach carpet to ramp or level using the zip ties you poked in the carpet when you were cutting it to size! The last wall should be a 3×3 grid of squares so attach it to the left side of the wall. You can then bend back two of the three columns for better access. Add one of the longer 31.5 in planks so that the lowest level will have support. Make sure you securely zip tie it into place on both sides! 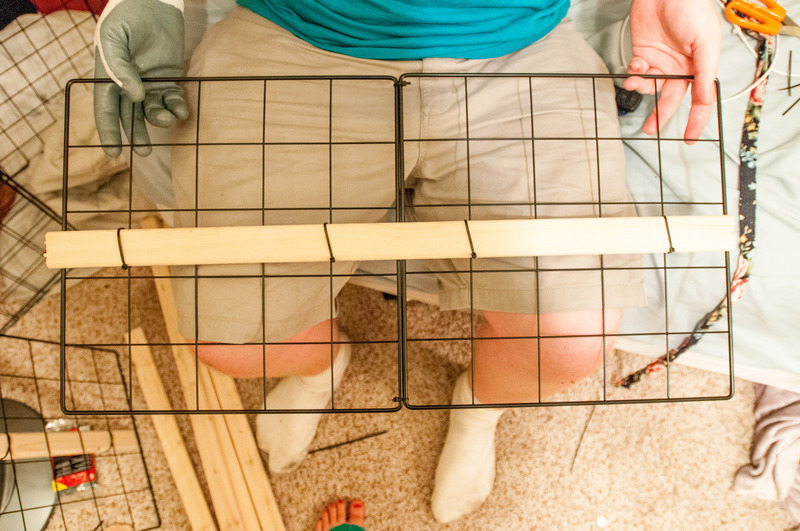 Then, add one of your 2-square levels on top of the support and zip tie it to all surrounding walls and support beam. At this time, if the carpet was flimsy, so I poked a few more holes and zip tied it to the side support walls. Make sure everything is nice and secure, especially if you have a larger bun! When you believe it is nice and secure, go ahead and add the lowest ramp. Connect the top of the ramp to one of the squares of a 2-square level. When that step is complete, you can move on to the level directly above the one you installed. 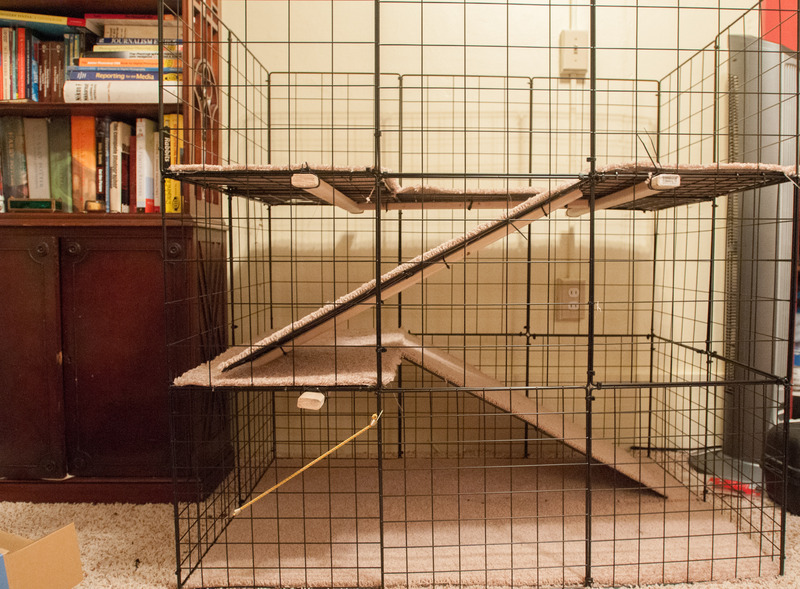 Do the same steps: add the support bar, secure it to the side of the cage, install the 2-square level and secure. Please excuse the messy room! Finally, install the third top-right level (leaving the sole 1-square piece and last ramp out.) Do the same steps as before: add the support bar, secure it to the side of the cage, install the 2-square level and secure. Finally add the one 1-square piece and diagonally connect the 19 in wooden plank to the bottom so it is zip tied to the surrounding squares. Finish installing the last ramp and the 1-square piece to the top, and then close the cage up and go around and secure everything! 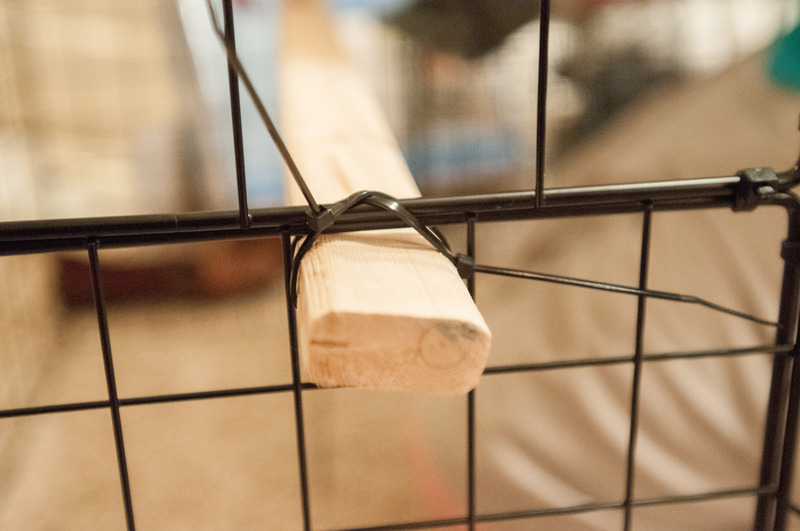 Secure the ramps to the side of the cage with zip ties, and make sure any and all junctures are secured with a zip tie as well. The last step is to make a door. 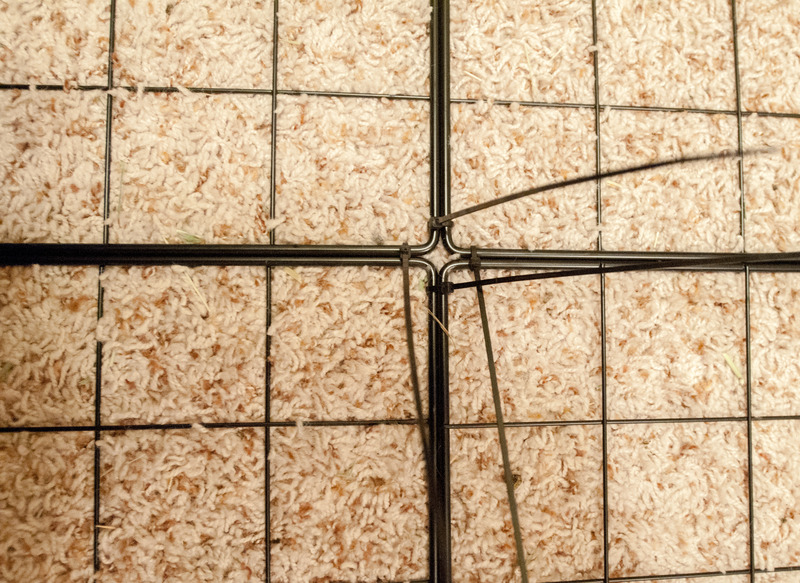 Disconnect the lower middle square’s zip ties from all the surrounding squares on two of the three sides leaving one side connected like a door hinge. The bungee cord purchase is to keep your bun from opening the door. Lastly, insert rabbit into new home and furnish with food, water, litter box and toys! If you have any questions about parts of this process, or things I may have forgotten to cover, please feel free to comment! This is pretty epic. Right now our rabbit is in a puppy run on our kitchen floor but I want to build a condo so she can get away from the baseboard heater and also see out of the windows. I’ll have to save this page so when I can build her a cage, I can follow this idea. I figure if you use cheap enough carpet, you can just snip the zips and replace the rug. We use cheapie rugs from Dollar Tree on our floor for her right now. I really want to make this but was wondering if it’s easy to clean? And what if the bunny pees on the carpet then what would I do to take it out and clean it ? In total, how many of the wire squares did you use? 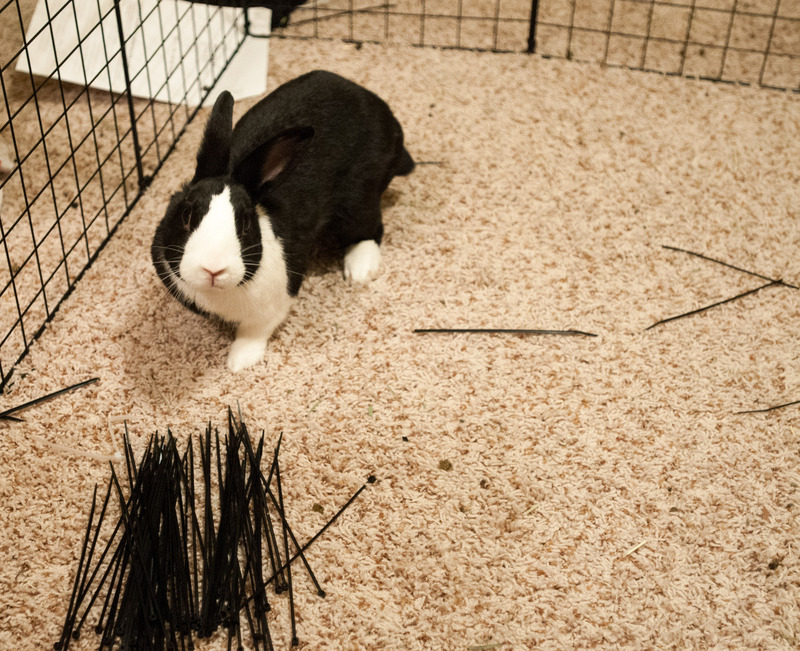 Also, my fear is the rabbit chewing all the plastic and wood. Did your guys’ do that?